Unfortunately, not possible. A common workaround for this is to hide the shadow using the vaccinator charge bars. The font for wavesui is not working. I have installed the font btw. Neither neutra nor surface is working, but when I use surface in other huds it works fine, also i can use neutra in microsoft word aswell. I don't think it's a problem of me installing the fonts. Could someone please help me fix this. wavesui is literally my favourite hud. Is it possible to get the overwatch hud low and buffed health border effect moved to egghud? If it's possible then how? I attempted to modify the PLR HUD using that file but it doesn't seem to contain as much information for it as PL does. I'm assuming it's mostly dictated from within the game, so I'm going to leave it alone for now. Do you happen to have a field name within sourcescheme to modify it? I can't seem to locate it, unless it's located in sourceschemebase. How do I make the item boxes bigger/smaller? Not a particularly short question, but I don't have someone actively on to message. I drew a grey box in huddemomanpipes.res and hudobjectivetimepanel.res. The problem is the boxes show up when they shouldn't. I probably just need a lesson on what the field name exactly does. FalkinghammerNot a particularly short question, but I don't have someone actively on to message. [quote=Falkinghammer]Not a particularly short question, but I don't have someone actively on to message. I'd like to make small adjustments to the default hud. I made an account just for this, so I'm new and very sorry if I mess something up. Mainly, is there a way of renaming the numbered backpack pages? For example instead of 2 it would say "Scout" and so on. And how does one remove the sorting dropdown, I don't want to ever click it and have my manual sorting destroyed. How do I change the color of the overheal cross on hypnotize's m0rehud? How do I remove the killstreak counter in a hud? WhitebockI'd like to make small adjustments to the default hud. then you must go to your custom folder and create a folder with some name. now in that folder create a folder called resource and i that folder create a folder called ui AND in that folder called ui create a folder called econ. then you need to create the most important file of the folder called info.vdf, to do so you create a text file. and choose in the bar in the upper left "File" then you need to choose "Save as" and you need to change the "Save as type" option to "All files" and save the file as "info.vdf". under ShowRarityComboBox you will find some definitions like "controlname" and "font", you need to search for a definition called "xpos" or "ypos" change the number next to them to "9999"
f2s4x1oHow do I change the color of the overheal cross on hypnotize's m0rehud? fnmHow do I remove the killstreak counter in a hud? [quote=Whitebock]I'd like to make small adjustments to the default hud. then you need to create the [b]most important[/b] file of the folder called info.vdf, to do so you create a text file. However, it does not flash on hit. are you sure that entry in hudlayout.res is fogCrosshair? However, it does not flash on hit. are you sure that entry in hudlayout.res is fogCrosshair? Yeah, it's definitely the right name. Not sure why it isn't working. is there anything else that could be affecting it? 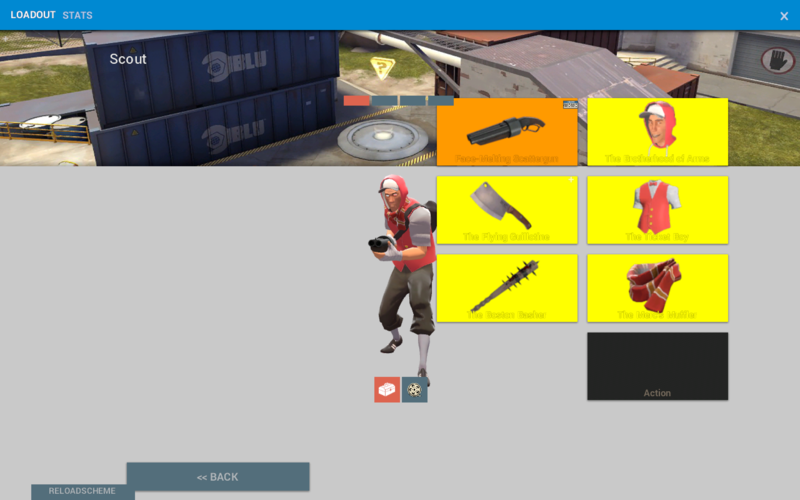 Is there a way to make an image cover the whole screen in my loadout screen and then a different image that covers the whole screen when you click on backpack that shows the classes you can edit loadouts and backpack, crafting etc or is this not possible? It feels like the loadout screen is a panel that does not cover the full screen. what file or field controls the target ID's that are seen when you're looking at someone in a kill cam? Konceptwhat file or field controls the target ID's that are seen when you're looking at someone in a kill cam? Thanks Xen for helping me find the files that I needed to look at modifying. However, after about 2 hours of work and tweaking stuff, I can't seem to get the last little bit of something that I'm aiming for. Another thing, don't mind the mismatched fonts in the two screens. I'm going to get to that later. How can I use a hud crosshair for one or two classes only and use some other crosshairs on the other classes? f2s4x1oHow can I use a hud crosshair for one or two classes only and use some other crosshairs on the other classes? KonceptThanks Xen for helping me find the files that I needed to look at modifying. However, after about 2 hours of work and tweaking stuff, I can't seem to get the last little bit of something that I'm aiming for. Another thing, don't mind the mismatched fonts in the two screens. I'm going to get to that later. [quote=Koncept]Thanks Xen for helping me find the files that I needed to look at modifying. However, after about 2 hours of work and tweaking stuff, I can't seem to get the last little bit of something that I'm aiming for. Another thing, don't mind the mismatched fonts in the two screens. I'm going to get to that later. Now my hud doesn´t want to show the ticks from the casual screen. Now i think this is a problem with ClientScheme.res but i am not sure and i don´t know what to do. I have even read a lot of other guides but i couldn´t find it. XenThePybro KonceptThanks Xen for helping me find the files that I needed to look at modifying. However, after about 2 hours of work and tweaking stuff, I can't seem to get the last little bit of something that I'm aiming for. Another thing, don't mind the mismatched fonts in the two screens. I'm going to get to that later. [quote=XenThePybro][quote=Koncept]Thanks Xen for helping me find the files that I needed to look at modifying. However, after about 2 hours of work and tweaking stuff, I can't seem to get the last little bit of something that I'm aiming for. Another thing, don't mind the mismatched fonts in the two screens. I'm going to get to that later. WetterhonkNow my hud doesn´t want to show the ticks from the casual screen. [quote=Wetterhonk]Now my hud doesn´t want to show the ticks from the casual screen. XenThePybro WetterhonkNow my hud doesn´t want to show the ticks from the casual screen. No i think everything there is fine, I even tryed copying it from the Basefiles from Clientscheme from the standart tf2 hud. But when i started up tf2 it still didn´t appear. [quote=XenThePybro][quote=Wetterhonk]Now my hud doesn´t want to show the ticks from the casual screen. The installer seems to be crashing all the time and I cannot find the ammo that looks like it does in the video.